For other uses of "34th Street station", see 34th Street station (disambiguation). For other uses of "Hudson Yards", see Hudson Yards (disambiguation). The station, originally part of the city's bid for the 2012 Summer Olympics and the failed attempt to build the West Side Stadium, was first scheduled to open in summer 2012. When London was chosen for the Olympics, the opening date was pushed to December 2013. In 2011, the opening was postponed to June 2014, pending the completion of the escalators and elevators in the station. After a series of delays involving escalator, elevator, and fire and safety systems, the station finally opened on September 13, 2015. The 34th Street station is the first completely new station in the New York City Subway system since 1989,[note 1] as well as the first such station funded by the government of New York City since 1950. The new construction, part of the city's and the MTA's master plan for the Far West Side, extended the IRT Flushing Line west from Times Square to Eleventh Avenue, then south to 34th Street. Although the West Side Stadium plan was rejected by city and state planning agencies, the 7 Subway Extension plan received approval to move ahead, as New York political leaders wanted to see the warehouse district west of Eighth Avenue and north of 34th Street redeveloped as part of the Hudson Yards Redevelopment, and subway service was to be an essential part of that effort. The extension also serves the Jacob K. Javits Convention Center, which was expanded in 2008–2014 and is located a block away from the station entrances. Wikimedia Commons has media related to Hudson Yards subway construction. 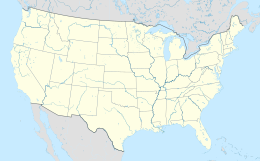 It was again proposed as part of the New York City bid for the 2012 Summer Olympics. The City wanted to get funding before July 2005, at which time the International Olympic Committee would vote on funding. However, due to shortfalls in the MTA's Capital Program, as well as preexisting funding for the Second Avenue Subway and East Side Access, the MTA could not pay to fund the extension. After a proposal for the West Side Stadium, an Olympic stadium to be located above the nearby West Side Yard, was rejected in 2005, New York City quickly lost their Olympic bid. For then-Mayor Michael Bloomberg, the extension was still a priority. His December 12, 2006, address to the New York League of Conservation Voters noted that in November 2006, the government began issuing bonds to fund the extension of the 7 subway to Eleventh Avenue and 34th Street. The extension was funded with New York City funds from municipal tax increment financing (TIF) bond sales that are expected to be repaid with property tax revenues from future developments in areas served by the extension. The one-station extension to the burgeoning Hudson Yards area was originally to cost US$2.1 billion, but eventually grew to US$2.4 billion, excluding a US$500 million intermediate station at 10th Avenue that was canceled due to costs. In October 2007, the MTA awarded a $1.145 billion contract to build 7,000 feet (2,100 m) of twin-tube tunnel to S3, a joint venture of J.F. Shea, Skanska USA Civil, and Schiavone. The contract was to build tunnel from the then-current 7 train terminus at Times Square westward underneath 41st Street to Eleventh Avenue, then down to 26th Street. Richard Dattner and Partners, Architects, designed the 34th Street station. After excavating the new terminal's shell and creating the first 1,000 feet (300 m) of tunnel using the drill-and-blast method, S3 placed two tunnel-boring machines (TBMs) in the ground to dig the remaining 6,000 feet (1,800 m); as it dug, each TBM placed precast concrete liner segments to create the tunnel interior. On December 21, 2009, the MTA said that a tunnel-boring machine broke through the 34th Street station cavern wall. Both tunnel-boring machines were scheduled to finish the required tunneling in the spring of 2010. In April 2011, the MTA announced that the contract covering the tunnels, the station mezzanine and passenger platform was 85% complete, and that the systems contract, covering mechanical and electrical systems, electric power, lighting and train tracks would be awarded by July 2011. The systems contract was awarded in September 2011. In May 2012, the MTA announced that the extension, now 65% complete, had received the installation of the first set of rails. By August 2013, the extension was 90% complete. On December 20, 2013, Bloomberg took a ceremonial ride on a train to the nearly-complete station, celebrating a part of his legacy as mayor, during a press tour of the extension. Train testing did not commence until June 2015. In January 2012, the station was touted as under-budget and on schedule to open in 2013, before a series of delays plagued the project. The station, originally part of the city's bid for the 2012 Summer Olympics, was supposed to first open as part of a two-station subway extension, including 10th Avenue station, in summer 2012. When London was chosen for the Olympics, the opening date was pushed to December 2013; the Tenth Avenue station was dropped from construction plans soon after. By June 2012, trains were still expected to run "for test purposes" by the end of 2013. That same month, the station's opening was delayed to June 2014 for completion of the station's fitting-out. Michael Horodniceanu, chief of MTA Construction Company, told The New York Times in January 2014 that complications in the installation of the inclined elevator would likely cause a further delay of about three months, bringing the opening date to very late summer or early fall of 2014, or to November 2014. [note 2] By March 2014, the station's tentative opening date was still to be in November 2014. Then, in May 2014, the opening was delayed again to install the inclined elevators, as they had originally failed a factory test in Como Province, Italy. Officials had insisted that the Italian-manufactured elevators had software and parts made from a variety of different companies in America, rather than from a single foreign company. However, the station was not delayed solely because of the elevators. The station's opening was also pushed to later dates due to "integrated testing for fire protection", which required the completion of all station infrastructure, including escalators, stairs, and elevators. Escalators and tunnel ventilation systems also caused the station to be delayed. At this point, the station was expected to open for service in late 2014,[note 2] but due to further elevator delays as well as problems with the extension's ventilation systems, it was delayed in October 2014 by a further few months, to February 2015. At this point, the project was so far delayed that the MTA was offered US$4.75 million in "incentive" money if the station opened by February 24, 2015. Software changes were made to solve the elevators' problems, and the elevators were installed. Testing would be complete by November. Three ventilation systems were already installed by October 1, 2014, with two more systems to be installed by the end of the month. On November 17, it was confirmed that February 24 would be the opening date for the station; new signs and the southern entrance's canopy started to be erected. However, just a month later, the MTA stated that it was unable to open the subway extension for service until April to July 2015, due to the failure to get the inclined elevators to work properly. The MTA also cited problems with the fire alarm and security systems as another reason for the delay. In addition, the developer of the Hudson Yards mega-development, The Related Companies, also needed to dig caissons for the foundations of 55 Hudson Yards, just above the subway station, and the foundation work needed to be complete before the MTA could proceed with opening the station. The MTA made another announcement, on March 24, 2015, saying that the station's opening would be delayed again to summer 2015, due to more problems with the fire and security systems. In addition, third rails, public service announcement systems, ventilation fans, escalators, and elevators would need to be tested. By April 2015, the station was complete, but unopened. On June 15, 2015, though, the extension was pushed back again to "before the end of the third quarter" of 2015. A month later, the MTA confirmed that the station would be opened on or before September 13, 2015. The opening date was confirmed on August 28, 2015. By this point, MTA chairman Thomas Prendergast had stated that the myriad delays in both the new station and in the other MTA Capital Construction projects were humiliating. The station opened on September 13, 2015, at 1:00 p.m., in a ribbon-cutting ceremony attended by New York City mayor Bill de Blasio, U.S. Senator Chuck Schumer, and former deputy mayor Dan Doctoroff. The secondary station entrance at 35th Street, as well as finishing touches within the station itself, was not expected to be completed until 2016. However, a couple of days after the station opened, there were some problems in and around the station, which multiple news outlets criticized. An escalator broke down on September 14, just a day after the station's opening. In an unrelated September 16 incident, a straphanger got injured while walking up another escalator at the 34th Street station. Earlier that day, the New York Post reported on signal problems in the brand-new tunnels around the station, while riders complained about the delays on Twitter and Reddit. A Wall Street Journal commentator remarked that "it's only a matter of months (make that weeks) before the gleaming station ... is pockmarked with chewing-gum spots, urban scrawl and litter." Overall, however, the station was received positively during its first few days of service. In an article in several newspapers distributed by NYC Community Media, Lenore Skenazy writes that many riders have praised the station's design, its cleanliness, and its climate-controlled platforms, and noted herself that the station looked and felt "as uplifting as a cathedral". In March 2016, news sources reported that despite the station's high cost, the station had maintenance problems: there were leaks in the ceiling of the corridors holding the escalators, the station's bathrooms were closed because of flooding from the street, and icicles had formed on the ceiling of the station. The MTA supposedly knew about the issues for several years, even during construction. The MTA board called these issues "unacceptable" and the contractor responsible for waterproofing the station spent $3 million to fix them. The leaky ceiling was reportedly fixed by May 2016. At least one passenger filed a lawsuit against the MTA because of injuries sustained after falling down an escalator to avoid the leaky ceiling. In 2017, part of the mezzanine was closed off so the MTA could build a mockup of the proposed R211 subway car. The model was open to the public from November 30 to December 6, 2017. The mockup contained features such as an open-gangway design proposed for this order; digital screens showing next stops and their station layouts; and a blue-and-gold-stripe paint design on its exterior. A secondary station entrance at the southwest corner of 35th Street and Hudson Boulevard opened on September 1, 2018, nearly three years after the station's opening. The secondary entrance provides access to the north end of the station. In March 2019, the MTA reported that the 34th Street–Hudson Yards station contained three of the ten least reliable subway escalators in Manhattan. Each of the escalators was out of service more than one-sixth of the time. One of these escalators, at the 35th Street entrance, was closed 25 times from October to December 2018. The approximately 1,200-foot-long (370 m) station, designed by Dattner Architects, has a single wide island platform serving two tracks, as well as eight staircases between the lower mezzanine and the platform. The platform itself is 35 feet (11 m) wide, which makes it much wider than many other island platforms in the subway system; by comparison, the Chambers Street station in Lower Manhattan has platforms that are 18.5 feet (5.6 m) wide, and the Second Avenue Subway stations are 27.8 feet (8.5 m) wide. The platform, at 585 feet (178 m) long, is among the longest in the IRT system, as well as the longest "column-free" platform of any station in the system. The station contains a total of 16 escalators: nine between the upper and lower mezzanine levels, and seven between the street and upper mezzanine levels. Nine of these escalators are only reachable from the main entrance at 34th Street, while seven are only reachable from the secondary entrance at 35th Street. At the main entrance, four escalators and two stairs lead from street level to that entrance's upper mezzanine. Past the main entrance's fare control, which is split into two banks, there are two parallel shafts down to the lower mezzanine. The northern shaft carries four escalators, while the southern shaft carries one up-only escalator and the two incline elevators. The secondary entrance contains an additional three escalators and a stair between the street and that entrance's upper mezzanine. Past the turnstiles, a single bank of four escalators leads to the lower mezzanine. While the main entrance's escalator shaft to the lower mezzanine is column-free, the secondary entrance's corresponding escalator shaft contains supporting columns in the center, between the inner two escalators. The lowermost escalators between the mezzanines are the system's longest and take about one minute and thirty seconds to traverse. The station also contains four elevators, all of which are only accessible via the main entrance. Two elevators travel vertically: one from street level to the upper mezzanine, and one from the lower mezzanine to platform level. The other two are incline elevators, traveling diagonally in the shaft between the main entrance's upper mezzanine and the lower mezzanine. The walls adjacent to the tracks have white tiles arranged in sets of three 15-foot (4.6 m) columns of 3 tiles each. There are two-tile-high gray squares containing white "34"s in the middle of each set of columns. They are pre-fabricated porcelain panels, in three-by-five slabs, to allow easy replacement. On the lower mezzanine, the architects used high ceilings and convex railings to make the station seem bigger, thus improving passenger flow. A tiling pattern, similar to that used on platform level, is also used on the lower mezzanine, though electronic advertisement panels are mounted on the walls at certain areas along the lower mezzanine. The cavernous station's design has been compared to that of Washington Metro stations, although early plans for narrow, Washington Metro-like platforms were scrapped. The station has also been compared to stations along London's Jubilee Line Extension, and in fact, the station's architecture was inspired by that of the Canary Wharf tube station on that extension. The Hudson Park and Boulevard project was also included with the construction of the station, since the park and station were built concurrently with both station entrances located inside the park. Wikimedia Commons has media related to Hudson Yards subway entrance. The station has two entrances and exits. The main station entrance and ventilation building consists of four escalators and an elevator on the west side of Hudson Boulevard between 33rd and 34th Streets. The main entrance has a turtle shell-shaped glass canopy above it that allows light to shine on the upper mezzanine. The elevator is located south of 34th Street in Hudson Park, while the escalator entrance is located further east, closer to the boulevard. At the time of construction, the ventilation building was designed so developers could built on top of it later. The 55 Hudson Yards skyscraper, whose structure is partially atop the ventilation tower, started construction in January 2015, and pictures in May 2016 showed that the skyscraper had so far been constructed to the height of the ventilation tower. The secondary entrance consists of escalators on the southwest corner of Hudson Boulevard East and 35th Street, and opened on Labor Day 2018. At both of the exits, the staircases and four escalators each go down 40 feet (12 m) to a fare control area, then another 80 feet (24 m) to the common lower mezzanine. Both entrances feature the glass canopy design, the first of their kind in the subway system. They are intended to stand out aesthetically. The entrances are interweaved with the Hudson Yards developments, with the main entrance wedged between 50 Hudson Yards to the east and 55 Hudson Yards to the west. The rest of the Hudson Yards development is located very close to the south of the station. Both entrances are based on a design by architect Toshiko Mori, which itself is based on the design of smaller station entrances in the Paris Métro. In the preliminary plans, there was to be an entrance inside the 3 Hudson Boulevard building, near where the secondary station building is located. However, as both entrances were to use a glass canopy cover independent of any Hudson Yards structures, the 3 Hudson Boulevard entrance was shelved in lieu of a subway entrance directly to the east of 3 Hudson Boulevard. Another plan called for an entrance at the southwest corner of Eleventh Avenue and 36th Street to serve the Javits Center directly. Under this plan, the secondary exit would have been relocated to the north side of 34th Street west of Hudson Boulevard. The station includes air-conditioning systems that keeps the station's temperature at 72 to 78 °F (22 to 26 °C) year-round. It also includes the largest ventilation towers in the New York City Subway stations. Originally, the new station was also planned to feature platform screen doors. However, plans for screen doors in New York City Subway stations were dropped in 2012 because doors for each platform edge would have cost $1 million. Unlike most stations in the system, which do not have open public restrooms, there are public restrooms at 34th Street–Hudson Yards. The station also has a stainless steel oval-shaped station agent booth. However, the station's turnstiles were based on an obsolete design by Cubic Transportation Systems, which had stopped mass-producing subway turnstiles in 1994. The MTA contracted Cubic to manufacture turnstiles specifically for the Hudson Yards station because the MTA's reserve of spare turnstiles had been entirely destroyed during Hurricane Sandy in 2012. Materials used in the station were designed to last at least 100 years. They include granite tile, ceramic tile, stainless steel panels on the walls, painted steel panels on the ceilings, energy-efficient fluorescent lamps and LEDs, and mesh. Additionally, the materials were supposed to conform to New York City Transit criteria, including slip-resistance. The station also uses acoustic ceiling tiles to reduce noise, in addition to using indirect lighting. The Hudson Yards station was also designed in accordance with National Fire Protection Association standards, despite its extreme depth, as it can be evacuated in six minutes in case of fire, and the platform can be cleared within four minutes. The station is the third station in the New York City Subway to have low vibration tracks installed. These tracks are described by the MTA as providing a smoother, quieter ride for passengers, and they eliminate the need for wooden sleepers. The station was not equipped with Wi-Fi or 3G at the time of opening, but these features were installed later. The station includes displays that accommodate the future inclusion of "countdown clocks" indicating the time until the next train, as well as Help Point emergency intercoms and in-station travel planners. Although the screens originally only displayed which track the next train would depart from, the screens were expected to start displaying countdown clocks when communications-based train control is implemented on the Flushing Line in 2018. As part of the MTA's "Arts for Transit" program, three mosaics by Xenobia Bailey, which total approximately 2,788 square feet (259.0 m2), were installed in three locations within the station. The artworks, titled Funktional Vibrations, are based on some of Bailey's crocheting patterns. One mosaic is located in an oval-shaped recession in the ceiling of the upper mezzanine at 34th Streets. The other two mosaics are located in the station entrances. The tiles used in Funktional Vibrations were created by mosaic craftsman Stephen Miotto, who manufactured the tiles in his Carmel, New York, studio. Another section of the artwork was installed at the second entrance. However, there is no artwork in the rest of the station; one Newsweek writer observed that while the station was "very clean but also a little antiseptic", "cool", and "efficient", it was also "lacking all character" with its austere design. The 80-foot (24 m) high incline elevators, which move at 100 feet (30 m) per minute (making an entire trip between the mezzanine levels in less than two minutes) and are sloped at a 27-degree angle, are the first of their kind in the system. Each elevator can hold up to 15 standing passengers or five wheelchair passengers. The inclined elevators were less expensive than vertically-traveling elevators, and were installed within the large escalator shaft at 34th Street. However, as the incline elevators had originally failed a factory test by its manufacturer Maspero Elevatori, there were multiple delays in opening the station, and the opening date was eventually delayed from December 2013 to late 2014, then to mid-2015. The use of inclined elevators was intended to provide wheelchair-bound patrons with a shorter, easier path to the train platform as well as to reduce tunneling costs. The two elevators were manufactured by Maspero Elevatori, in Appiano Gentile, Italy, using a controller made on Long Island, speed governors made in Ohio, and buttons and other parts in Queens. The software for the elevator was written in the United States. Maspero Elevatori assembled the elevators in Italy, and they failed an operational test there, prior to being shipped to the United States. The MTA said the manufacturer chose to use American subcontractors in place of local Italian suppliers after reading the specifications the transit agency submitted. The MTA worked with the manufacturer to try to resolve the problems caused by a very high level of customization. The tracks of this station continue south of the station, down to 25th Street, to allow trains to be stored south of the station during off-peak hours; the tail tracks are seven blocks long, enough to store three 11-car trains each, since the delivery of the R188 train cars was to add 66 more cars to the fleet of the 7 service. There are also two diamond crossovers, one north and one south of the station. The storage tracks at this location were constructed due to the Corona Yard in Queens lacking any space to hold any more trains, and expanding the yard is very difficult due to its location next to the Flushing River. A new storage yard elsewhere would be prohibitively expensive, as it would cost hundreds of millions of dollars. The station was expected to be very heavily used, due to its location as "the only subway line serving the area west of Ninth Avenue below 59th Street", as well as its status as the main subway station for the Hudson Yards area and the closest station to the busy Javits Center. Originally, the station was projected to serve 27,000 passengers per day, or about 9.855 million passengers per year, when it first opened. After the Hudson Yards is complete, ridership was to grow very heavily, with an average of 35,000 people per hour using the station at its peak by 2020. By September 2015, though, projections had increased to a proposed ridership of 32,000 people per hour. The projected 2025 ridership of 200,000 daily riders is more than at Times Square station, the station with the most ridership as of 2013[update] with 197,696 riders a day. Projections predicted that during the morning rush hour alone, 26,000 passengers will be leaving the station, while 15,000 will be simultaneously entering the station. This will make it the busiest New York City subway station that is not a transfer station. The station is built to handle an even higher capacity of 40,000 passengers per hour during peak times and events at the Javits Center. The high projected ridership is despite the fact that it was once described as a station on an "extension to nowhere", given the relative sparseness of the area in 2007. As late as 2011, it was thought that the city was wasting money on the station because, at the time, Hudson Yards had not yet been finalized. It was reported that only 7,000 daily riders entered the station between September 13–22, 2015, drastically below the MTA's projected ridership of 32,000 passengers upon the station's opening. This was attributed to incompleteness of developments in the area, as well as an unopened entrance to the High Line park, which is nearby. In late October 2015, AM New York found that the average daily ridership was even lower, at only 5,900 passengers per day, except for during the 2015 New York Comic Con on October 8–11, when average daily ridership reached 18,300 daily riders. The station's official ridership between September 13 and December 31, 2015, was 692,165, making it the 392nd busiest station in the city out of 422 total stations. Ridership at the station increased in 2016 with 2,691,851 riders, making it the 189th busiest station in the city. 2017 saw an increase to 3,098,699 riders, still drastically below predictions, averaging out to about 10,000 per weekday. Besides serving Hudson Yards, the area serves the Javits Center; western Chelsea and Hell's Kitchen; and a nearby intercity bus stop that serves passengers who are boarding Megabus and BoltBus routes. The warehouse district west of Eighth Avenue and north of 34th Street was rezoned in 2005 into a commercial and residential area, and the station is part of an effort to accelerate development in the area. The reportedly "transformative" subway extension to 34th Street spurred development in the Hudson Yards area by providing transit access for future tenants of the Hudson Yards development. In addition, the extension fit within the MTA's goal of transit-oriented development, namely to "ensure that all new residential and commercial growth in the MTA region between 2008 and 2030 is concentrated within a half-mile of an MTA station". In addition to providing transit access to residents and tenants of nearby neighborhoods, the construction of the station was expected to bolster the area's commercial growth and, in turn, creating up to 50,000 jobs in the area. Mitchell Moss, director of New York University's Rudin Center for Transportation Policy & Management, states that the development of Hudson Yards, and the related subway extension, were among the benefits of the 2012 Olympic bid, saying that "the #7 Extension will be one of the largest expansions of the New York City transit system in decades and one of the most significant in terms of its potential impact." Moss says that redevelopment of the west side was a direct result of the new subway station's construction. Kenneth T. Jackson, editor of The Encyclopedia of New York City, describes the extension as a "very important" one. However, Lois Weiss of Bisnow wrote that the potential number of workers at Hudson Yards could also put a burden on the station capacity as well as on nearby buses. Since the station started construction, land prices in the immediate area have nearly doubled. Interest in the surrounding area has also grown, as many development companies are going to Hudson Yards to buy air rights; for instance Related Companies, already the developer of Hudson Yards, entered a contract to buy a $75 million-plus parcel of land between 35th and 36th Streets and between Eleventh Avenue and Hudson Boulevard, as well as land over a McDonald's to build 50 Hudson Yards. Also as a result of the subway extension, three tenants have already been found for 10 Hudson Yards, and Citigroup is considering moving to the area. Most importantly, however, the $750 million platform supporting much of Hudson Yards was built starting in January 2013; subway construction for a station that could potentially carry up to 27,000 daily passengers necessitated the construction of more buildings, as 70% of tenants are expected to come to Hudson Yards via the 7 subway extension. Additionally, new restaurants, luxury condominiums, and stores have appeared near the station and along the extension's route, and residential prices along the extension have also increased. A construction boom has occurred in the greater Hudson Yards area as well. The station is described by the MTA as the centerpiece of the Hudson Park and Boulevard, as well as of the entire Hudson Yards project, which developers say could not have been started without the 7 subway extension. Horodniceanu stated that "this new, modern station will be the lifeline of Manhattan's newest neighborhood. It will make it possible for thousands of residents, employees and visitors to get to Hudson Yards easily and quickly. Without the extension, this new development would not have been possible." The completion of the High Line and the Hudson Boulevard, as well as the Javits Center renovation, are boosting development in the area as well. Although Hudson Yards was not finished at the time of the station's opening, the High Line and the Javits Center immediately became popular destinations for station patrons. ^ a b The last unique stations—Lexington Avenue–63rd Street, Roosevelt Island, and 21st Street–Queensbridge, opened on October 27, 1989. The new South Ferry station platform opened on March 16, 2009, but replaces a pre-existing station and also connects to the Whitehall Street station. ^ a b The exact opening date at this time was unclear. The tentative opening date was given by alternate sources as either November 2014, fall or winter 2014, fall 2014, or simply "2014". ^ The depth is so that there is minimal disruption to the structures above the station, such as the Lincoln Tunnel. ^ There are other accessible New York City Subway stations, but the 34th Street–Hudson Yards station is the first to be built with ADA access in mind. ^ a b c d e f g h "MTA's 469th Station is First Addition to Subway System in 26 Years". MTA. September 13, 2015. Retrieved September 13, 2015. ^ Shaping the City's Future (PDF) (Report). Department of City Planning. 1993. ^ Bagli, Charles V.; Cooper, Michael (June 7, 2005). "Olympic Bid Hurt as New York Fails in West Side Stadium Quest". The New York Times. Retrieved September 12, 2015. ^ Hinderer, Katie (December 13, 2006). "NYC Mayor Outlines Long-Term Growth Plan". GlobeSt.com. Archived from the original on May 13, 2009. Retrieved February 28, 2010. ^ "City Raises $2 Billion in Bonds For No. 7 Line Extension". NY1. December 7, 2006. Archived from the original on October 11, 2007. Retrieved February 28, 2010. ^ a b c "Readers Write: LI competing for transportation dollars". May 29, 2014. Archived from the original on March 5, 2016. Retrieved May 29, 2014. ^ "Transit Board Approves Funding For 7 Line Extension". NY1. October 25, 2007. Archived from the original on March 25, 2008. Retrieved February 28, 2010. ^ "Former Mayor Bloomberg and Governor Spitzer Announce Start of Construction on No. 7 Subway Extension" (Press release). New York City Mayor's Office. December 3, 2007. Retrieved February 28, 2010. ^ a b c "No. 7 Subway Line Extension". Richard Dattner & Partners Architects. Archived from the original on March 15, 2012. Retrieved February 28, 2010. ^ a b c d e "Various Visions of the Future in NYC's First New Subway Station in 25 Years". Hyperallergic. September 15, 2015. Retrieved September 17, 2015. ^ a b c d e f g h i j "Capital Program 7 Line Extension". MTA.info. December 20, 2013. Retrieved January 30, 2014. ^ "Work on Extending the No. 7 Line Continues to Progress". MTA Press Release. Retrieved April 10, 2014. ^ "Work to Begin Under Last Major Contract Needed to Extend the 7". MTA.info. September 14, 2011. Retrieved September 16, 2011. ^ Luther S. Miller (May 10, 2012). "NYCT's No. 7 extension gets first rails". Railway Age. ^ "7 Line Extension 90 Percent Complete". MTA Press Release. Retrieved August 22, 2013. ^ a b "Mayor Bloomberg gets ride on No. 7 subway line extension he championed". Daily News. New York. December 21, 2013. Retrieved December 22, 2013. ^ "Bloomberg Takes Inaugural Ride on 7 Train Extension to Far West Side – Hell's Kitchen & Clinton". Dnainfo.com New York. December 20, 2013. Archived from the original on December 24, 2013. Retrieved December 24, 2013. ^ Davies, Alex (December 20, 2013). "Mayor Bloomberg Took The First Ride on NYC's New Subway Extension". Business Insider. Retrieved April 21, 2014. ^ "Mayor Bloomberg, MTA Officials Take Ceremonial First Ride on 7 Subway Train Extension". MTA.info. December 20, 2013. Retrieved May 14, 2014. ^ 7 Line Extension Train Operator and Dispatcher Training (YouTube video). New York Metropolitan Transportation Authority. May 31, 2015. ^ a b Coen, Amanda (January 19, 2012). "New York City's 7 Line Extension is Ahead of Schedule & Under Budget". Inhabitat. Retrieved May 13, 2014. ^ a b c d e Cuozzo, Steve (June 5, 2012). "No. 7 train 6 mos. late". New York Post. Retrieved April 21, 2014. ^ "NYCT gives Mayor Bloomberg ceremonial ride on 7 Subway Extension | Railway Track & Structures". Rtands.com. December 23, 2013. Retrieved December 24, 2013. ^ "More Delays and Rising Cost for Project Connecting L.I.R.R. to Grand Central Terminal". The New York Times. January 27, 2014. ^ a b Kabak, Benjamin (February 27, 2014). "7 line extension opening now projected for November". Second Avenue Sagas. Retrieved March 5, 2014. ^ "No. 7 train extension delayed". The Real Deal. January 27, 2014. Retrieved April 21, 2014. ^ a b Zoe Rosenberg (August 14, 2014). "Tour Hudson Boulevard and Park, the City's Next Park Avenue". Curbed. Retrieved August 26, 2014. ^ a b "MTA: Fulton Street Transit Center to open June 26". The Real Deal. March 25, 2014. Retrieved April 21, 2014. ^ a b c d Donohue, Pete (April 28, 2014). "Metropolitan Transportation Authority building New York City subway system's first inclined elevator". Daily News. New York. Retrieved April 29, 2014. ^ Harshbarger, Rebecca (May 13, 2014). "Manhattan gets first commuter ferry stopping along Hudson". New York Post. p. 4. Retrieved May 17, 2014. ^ a b c d e f g h i j Flegenheimer, Matt (May 29, 2014). "With New Slant on Subway Elevators, Expect Delays". The New York Times. Retrieved May 29, 2014. ^ "Hudson Yards Set to Alter Skyline, Transform Neighborhood". Chelsea Now. February 6, 2013. Retrieved June 2, 2014. ^ "Fancy New 7 Train Extension Expected To Open in February". Gothamist. October 1, 2014. Archived from the original on October 3, 2014. Retrieved October 1, 2014. ^ Mueller, Benjamin (June 23, 2014). 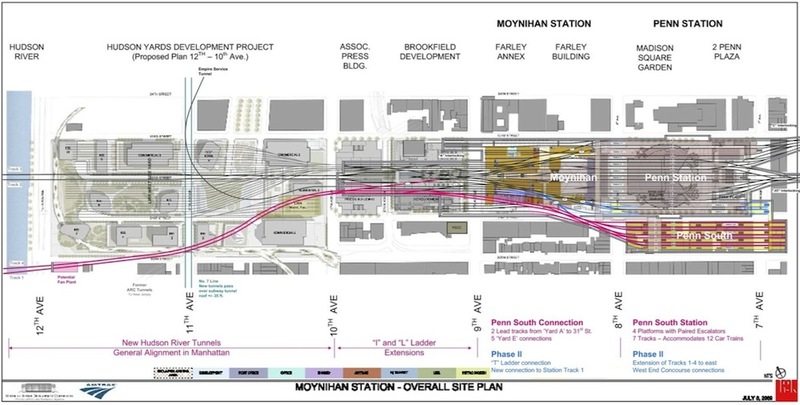 "Transit Hub and Work on No. 7 Line Face Delays". The New York Times. ^ a b Donohue, Pete (October 1, 2014). "No. 7 subway line extension to West Side on track to open in February: official". Daily News. New York. Retrieved October 12, 2014. ^ Mocker, Greg (November 17, 2014). "What would you call the newest subway stop in NYC?". PIX11. Retrieved December 4, 2014. ^ a b c "New York will have to wait till spring for No. 7 subway extension". Daily News. New York. December 15, 2014. Retrieved December 15, 2014. ^ "7 subway line extension delayed yet again, eyes summer opening". New York Business Journal. March 24, 2015. ^ Goldberg, Barbara (December 21, 2014). "NYC subway extension may transform Manhattan neighborhood". McCall.com. ^ Rebecca Harshbarger (December 15, 2014). "7 train opening delayed". New York Post. ^ Emma G. Fitzsimmons (March 24, 2015). "More Delays for No. 7 Subway Line Extension". The New York Times. Retrieved March 29, 2015. ^ Jaffe, Eric (March 24, 2015). "New York's Newest Subway Expansion Is Delayed, But at Least the Photos Are Gorgeous". City Lab. Retrieved April 10, 2015. ^ Dennis Green (April 29, 2015). "A series of delays have kept a now fully completed subway station under Manhattan from opening". Business Insider. Retrieved May 7, 2015. ^ Jose Martinez (June 15, 2015). "MTA: 7 Line Extension to Open Up Before End of Third Quarter". NY1. Retrieved June 20, 2015. ^ Emma Whitford (July 20, 2015). "7 Line Extension Will Open "By September 13th"". Gothamist. Archived from the original on July 22, 2015. ^ "Hudson Yards Subway Extension to Open in September: MTA". NBC New York. ^ Tangel, Andrew (August 28, 2015). "At Last: New Station for 7 Train Set to Open". WSJ. Retrieved September 10, 2015. ^ Newman, Philip (September 10, 2015). "No. 7 station to open at last on 11th Ave. in Manhattan". TimesLedger. Retrieved September 10, 2015. ^ a b c d e Fitzsimmons, Emma G. (September 12, 2015). "Subway Station to Open This Weekend, Bringing 7 Line to Far West Side". The New York Times. Retrieved September 13, 2015. ^ * Fitzsimmons, Emma G. (September 10, 2015). "Subway Station for 7 Line Opens on Far West Side". The New York Times. Retrieved September 13, 2015. "New 7 line subway extension to the West Side opens". ABC7 New York. September 13, 2015. Retrieved September 13, 2015. Tangel, Andrew (September 13, 2015). "New Subway Station Opens on NYC's Far West Side". WSJ. Retrieved September 13, 2015. "Photos: NYC's Newest (And 469th) Subway Station, 34th Street-Hudson Yards, Is Open". Gothamist. September 13, 2015. Archived from the original on September 15, 2015. Retrieved September 13, 2015. ^ a b "Sneak Peek: Hudson Park & Boulevard". Retrieved October 29, 2014. ^ Saul, Emily (September 14, 2015). "Escalator broken at new 7 train station after just one day". New York Post. Retrieved September 16, 2015. ^ a b "Escalator Breaks At Brand-New Hudson Yards No. 7 Subway Station". CBS New York. September 14, 2015. Retrieved September 16, 2015. ^ Kapp, Trevor (September 16, 2015). "Straphanger Injured on Escalator at New Hudson Yards 7 Train Stop". DNAinfo New York. Archived from the original on September 17, 2015. Retrieved September 16, 2015. ^ Li, David K. (September 16, 2015). "Brand new subway station already plagued by delays". New York Post. Retrieved September 16, 2015. ^ "New 34th St-Hudson Yards Station Not 1000% Perfect, Outraging NYers". Gothamist. September 16, 2015. Archived from the original on September 18, 2015. Retrieved September 16, 2015. ^ Gardner, Ralph Jr. (September 16, 2015). "Behold, the Shiny and Spotless Hudson Yards Station". Wall Street Journal. Retrieved September 16, 2015. ^ "7 Extension a Great Addition, Say Early Adopters". chelseanow.com. September 17, 2015. Retrieved September 17, 2015. ^ Skenazy, Lenore (September 14, 2015). "Stop it – the Hudson Yards subway station got built, and it's beautiful". Downtown Express. Retrieved September 16, 2015. ^ "New $2.45 Billion Hudson Yards Station Is Already A Crumbling Hot Mess". Gothamist. March 15, 2016. Archived from the original on April 2, 2016. Retrieved March 30, 2016. ^ Kaden, Allison (March 18, 2016). "Reports say MTA knew about leak problems at Hudson Yards station since 2013". New York's PIX11 / WPIX-TV. Retrieved March 30, 2016. ^ "Leaks at Hudson Yards Station Frustrate M.T.A. Board". The New York Times. March 22, 2016. ^ Tangel, Andrew (May 27, 2016). "Relief for Subway Riders as Dripping Stops at Hudson Yards Station". Wall Street Journal. ISSN 0099-9660. Retrieved July 5, 2016. ^ Rajamani, Maya (March 29, 2016). "Woman Who Fell in Leaky Hudson Yards Subway Station to Sue MTA, Lawyer Says". DNAinfo New York. Archived from the original on October 9, 2016. Retrieved October 7, 2016. ^ a b Rivoli, Dan (September 5, 2017). "New subway train prototype up but hidden at Hudson Yards station". NY Daily News. Retrieved September 5, 2017. ^ Rivoli, Dan (November 30, 2017). "MTA unveils models of future subway cars available for viewing". NY Daily News. Retrieved December 1, 2017. ^ Barone, Vin (November 30, 2017). "Tour the MTA's potential new subway cars". am New York. Retrieved December 1, 2017. ^ a b c d e f "MTA Opens Second Entrance at 34 St-Hudson Yards 7 Station". www.mta.info. Metropolitan Transportation Authority. September 1, 2018. Archived from the original on September 2, 2018. Retrieved September 2, 2018. ^ Martinez, Jose (March 15, 2019). "As Hudson Yards Rises, Broken Subway Escalators Make for Steep Climbs". Intelligencer. Retrieved March 17, 2019. ^ a b c d e f g h i j k l m "A Tour of NYC's Newest Subway Station With Its Architect". Curbed NY. September 21, 2015. Retrieved September 24, 2015. ^ a b c d e f g "New 7 Line Extension to 11 Avenue". mta.info. Retrieved September 13, 2015. ^ a b c d e f g h i "Subway planners present the No. 7 extension, with room for improvement". Capital New York. February 15, 2011. Retrieved May 8, 2014. ^ "Rapid Transit Station Design". nycsubway.org. 1920. ^ a b "Photos: Inside the 7 line extension". Second Ave. Sagas. Retrieved October 29, 2014. ^ "7 Line Extension 082". Flickr – Photo Sharing!. ^ a b c d "Photos, Video: Ecstatic 7 Train Riders Test Out The New 34th St-Hudson Yards Station". Gothamist. September 14, 2015. Archived from the original on September 15, 2015. Retrieved September 14, 2015. ^ Kelly Weill. "Photos: Inside The New 7 Train Extension". Gothamist. Archived from the original on December 23, 2013. Retrieved December 23, 2013. ^ a b c "Hudson Yards: A Better Commute" (PDF). Related Companies. Retrieved June 12, 2014. ^ "MTA opens new $530M South Ferry station". Retrieved July 21, 2016. ^ "MTA Turning Acres Above Hudson Yards Subway Station into New Park". NY1. September 25, 2014. Archived from the original on October 26, 2014. Retrieved October 26, 2014. ^ Fedak, Nikolai (November 6, 2014). "Construction Update: Hudson Park & Boulevard". New York YIMBY. Retrieved July 11, 2017. ^ a b c d "NYC DoT Maps: 34 St-Hudson Yards" (PDF). mta.info. New York City Department of Transportation. 2016. Retrieved July 5, 2016. ^ Plitt, Amy (June 25, 2013). "Check out progress on the MTA's 7-train extension (photos)". Time Out New York. Retrieved May 8, 2014. ^ "Construction starts on 55 Hudson Yards | Real Estate Weekly". rew-online.com. Retrieved February 10, 2016. ^ Warerkar, Tanay (May 18, 2016). "Construction on 55 Hudson Yards Is Finally Making Progress". Curbed NY. Retrieved September 30, 2017. ^ a b c "Benefits of the 7 Line Extension". Metropolitan Transportation Authority. ^ Fedak, Nikolai (May 12, 2015). "New Look at Related's West Side Yards, at Hudson Yards". New York YIMBY. Retrieved September 18, 2017. ^ Mafi, Nick (September 22, 2015). "New York City Opens Its First Subway Station in Nearly Three Decades". Architectural Digest. Retrieved September 18, 2017. ^ Alberts, Hana (June 11, 2013). "3 Hudson Boulevard's Sky Club, Possible Condos Revealed". Curbed NY. Retrieved June 4, 2014. ^ a b Donohue, Pete (August 4, 2006). "Cooler Subways Coming – Eventually". Daily News. New York. Retrieved February 28, 2010. ^ a b Roberts, Sam (September 30, 2013). "No Heel Hazards (or Gusts) as Subway Expands". The New York Times. New York. Retrieved May 5, 2014. ^ a b c d Bautista, Christian Brazil (September 15, 2015). "City expands subway system for the first time in 26 years". Real Estate Weekly. Retrieved September 17, 2015. ^ "MTA Plans To Install Platform Doors on 7 Line Extension". NY1. September 8, 2007. Archived from the original on March 25, 2008. Retrieved January 8, 2014. ^ Dana Rubenstein (December 12, 2012). "No Seoul-style platform doors for New York subways, even in new stations". Capital New York. Retrieved May 29, 2014. ^ Stieber, Zachary (January 24, 2013). "NYC Subway Deaths Spur Officials to Call for Action". The Epoch Times. Archived from the original on November 5, 2013. ^ Haddon, Heather; Klopsis, Nicholas (April 11, 2010). "Flush with filth: Many subway station bathrooms dirty, or locked up". AM New York. Archived from the original on April 15, 2010. Retrieved April 16, 2010. ^ Robbins, Christopher (February 25, 2014). "Map: Where Are The Usable Subway Bathrooms?". Gothamist. Archived from the original on April 20, 2014. Retrieved May 8, 2014. ^ a b c Alexander Nazaryan (September 15, 2015). "New York's Newest Subway Station: a Gateway to Dubai-on-the-Hudson". Newsweek. Retrieved September 16, 2015. ^ D'Amato, Peter (December 3, 2015). "With a shortage of turnstiles, the MTA went back to a mothballed design". Crain's New York Business. Retrieved December 17, 2017. ^ "Capital Programs 7 Line Extension". Metropolitan Transportation Authority. ^ "Mayor Bloomberg joins MTA officials and local leaders for the first ride on the 7 Train extension". nyc.gov. December 20, 2013. Retrieved September 18, 2017. ^ La Gorce, Tammy (November 17, 2016). "Who Installs the New Mosaics in New York's Subways?". The New York Times. ISSN 0362-4331. Retrieved November 28, 2016. ^ "Track map for the Gateway Program". Second Avenue Sagas. Archived from the original on August 19, 2013. ^ "Hudson Yards rendering" (PDF). Hudson Yards Redevelopment Project. Archived from the original (PDF) on May 12, 2014. ^ "The Deepest and Highest Subway Stations in NYC: 191st St, 190th Street, Smith & 9th". Untapped Cities. Retrieved October 29, 2014. ^ "Mayor Bloomberg, MTA Officials, and local leaders take first ride on 7 Subway Train Extension". Retrieved October 29, 2014. ^ "New NY subway station links to booming West Side » Bulletin Leader". Bulletin Leader » News & Information. September 15, 2015. Retrieved September 17, 2015. ^ Flegenheimer, Matt (December 20, 2013). "For a Mayor on His Way Out, a Subway Station on Its Way In". The New York Times. Retrieved December 24, 2013. ^ "7 Line Extension" (PDF). Metropolitan Transportation Authority. September 14, 2012. Archived from the original (PDF) on April 15, 2014. ^ a b Larry Penner (December 26, 2013). "What's Missing From the No. 7 Line Extension". The New York Observer. Retrieved May 9, 2014. Remember that the existing Flushing, Queens, subway yard is already operating at capacity. This facility, built adjacent to wetlands, has little opportunity for expansion. ^ a b "New Subway Station Opens Servicing New York's Javits Center". Successful Meetings. September 14, 2015. Retrieved September 17, 2015. ^ Dobkin, Jake (February 8, 2012). "Check Out These Crazy Pix of the New 7 Train Extension". Gothamist. Archived from the original on March 27, 2015. Retrieved May 8, 2014. ^ a b Barbara Goldberg (December 18, 2014). "New York City subway extension may transform Manhattan neighborhood". Reuters. Retrieved December 31, 2014. ^ Lisberg, Adam (April 27, 2010). "Bills coming in on Bloomberg's 7 train extension". Daily News. New York. Retrieved May 8, 2014. ^ Kabak, Benjamin (April 14, 2011). "Stirrings of development at Hudson Yards". Second Ave. Sagas. Retrieved September 17, 2015. ^ Furfaro, Danielle (September 21, 2015). "Ridership at new Hudson Yards station much lower than expected". New York Post. Retrieved September 23, 2015. ^ "Fewer than 6K riders daily using new subway station". am New York. October 26, 2015. Retrieved October 28, 2015. ^ a b Nonko, Emily (September 11, 2013). "Hudson Yards: New York City's Mega-Development to End All Mega-Developments". NewYork.com. Archived from the original on May 12, 2014. Retrieved May 9, 2013. ^ a b Volpe, Joseph (May 7, 2014). "New York's next big neighborhood is its smartest". Engadget. Retrieved May 9, 2014. ^ "Find information on megabus.com bus stops". megabus.com. Retrieved September 8, 2016. The stop is one block west of the Husdon Yards [sic] station at the end of the number 7 subway line. ^ R, Polina (September 8, 2015). "NY Boltbus Station Locations". Bus Travel Review | Wanderu. Retrieved September 8, 2016. This is an outdoor BoltBus NY stop located in Midtown West, 300 feet west of the Northwest corner of 33rd Street and 11th Avenue. ^ Goldberg, Barbara (December 18, 2014). "NYC subway extension may transform Manhattan neighborhood". Yahoo News. Reuters. Retrieved December 18, 2014. ^ Satow, Julie (April 3, 2012). "Development Thrives in the Hudson Rail Yards". The New York Times. New York, New York. Retrieved April 21, 2014. ^ Soria, Chester (September 13, 2015). "Long-awaited Hudson Yards subway station opens after years of delay". Metro. Retrieved September 14, 2015. ^ Bloomberg News. "Digging deep for the No. 7 line." Newsday. New York. February 20, 2009. Page 8. ^ Weiss, Lois. "Hudson Yards Will Be A Transportation Torture Chamber". Bisnow. Retrieved September 30, 2017. ^ a b c d e Daniel Geiger (October 6, 2013). "Hudson Yards' lucky No. 7". Crains New York Business. Retrieved August 27, 2014. ^ a b c d Schlossberg, Tatiana (October 2, 2014). "Promise of New Subways Has West Siders Excited and East Siders Skeptical". The New York Times. Retrieved October 26, 2014. ^ Bagli, Charles V. (June 19, 2015). "Redevelopment of Manhattan's Far West Side Gains Momentum". The New York Times. Retrieved September 13, 2015. ^ "Start of a New Stop: 7 Line Comes to Hudson Yards". chelseanow.com. September 17, 2015. Retrieved September 17, 2015. Wikimedia Commons has media related to 34th Street – Hudson Yards (IRT Flushing Line). This page was last edited on 29 March 2019, at 03:34 (UTC).